Best Management Practice (BMP) verification is a process that includes initial inspection, follow-up checks and evaluation of BMP performance. Best management practice (BMP) verification is “the process through which agency partners ensure practices, treatments and technologies resulting in reductions of nitrogen, phosphorus and/or sediment pollutant loads are implemented and operating correctly.” It can be viewed as a life cycle process that includes initial inspection, follow-up checks and evaluation of BMP performance. Why is BMP Verification important to local stream and Bay restoration? 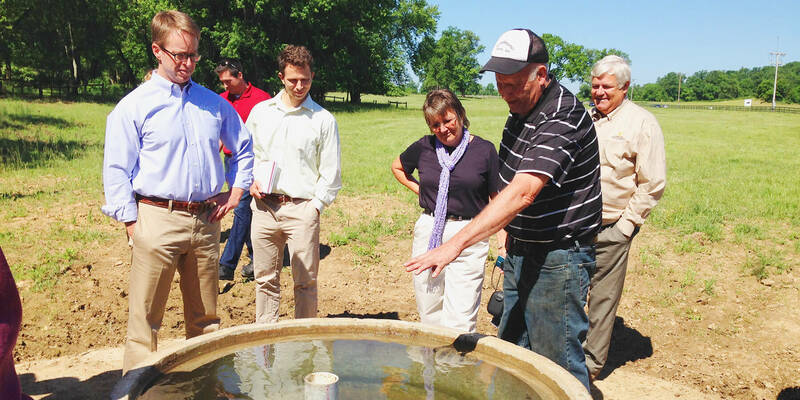 The implementation, tracking and reporting of BMPs has been at the center of the Chesapeake Bay Program partnership’s restoration efforts for almost three decades. When properly installed and functioning, these conservation and technological practices reduce the amounts of nutrients and sediment entering local waters and the tidal Chesapeake Bay. In addition, these practices can help reduce local flooding, protect sources of drinking water, ensure against the collapse of stream banks and support local economies through the return of clean water and viable habitats suitable for recreational activities. Conversely, improperly installed or functioning BMPs do little to mitigate the effects that nutrient and sediment runoff can have on local waterways. The Chesapeake Bay Program partnership must be rigorous in its tracking of its partners’ progress toward meeting goals for cleaner Bay waters. In order to do so accurately into the future, it will be critical for the partnership to verify that BMPs across the region are being implemented correctly and are, in fact, effectively reducing nutrient and sediment pollution as expected. It will help the partnership measure success, locate areas in which partners need to adapt, and ensure that these conservation and technological practices are doing the job of protecting people’s properties, lands, riparian habitats and local streams. 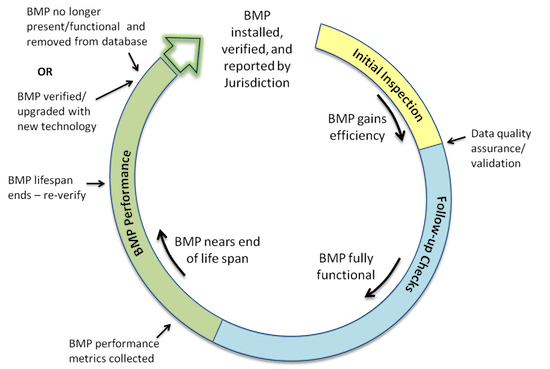 The Bay Program partnership views verification as a life cycle process, including initial inspection, follow-up checks and evaluation of BMP performance. The first part of the life cycle is the initial inspection upon the installation of the BMP, meant to answer the question, “Is the BMP there?” Following the initial inspection and reporting of the data, quality assurance and validation of the data ensures that the data was collected, compiled and submitted correctly, and that issues of double counting and the clean-up of historical BMP data have been addressed. The second part of the life cycle is completion of follow-up checks, carried out at the appropriate frequency to ensure that the BMP is operating correctly throughout the lifespan of that practice. The third part of the life cycle is performance outcomes. This stage is focused on the systematic collection of data that will be used to ensure that the BMPs are working as expected, while also allowing the partnership to adapt approaches to the future installation and maintenance of the practices, and to help further refine their pollutant reduction efficiencies. Who is involved in verifying BMPs?